The description said wings were embroidered and that was not so. Just some stitching inside the wing and the wings are peeling up so it remains to be seem what this shirt will look like when washed. Just hope my hubby likes it's anyway. 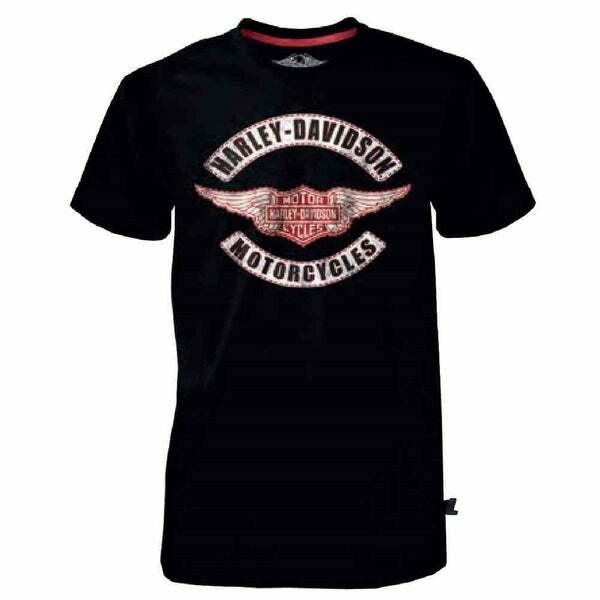 Harley-Davidson® Men's Black Label Collection. Men's Genuine Short Sleeve Limited Edition T-Shirt. Features a high quality winged Bar & Shield stitched graphic on front. Distressed famous #1 skull logo on back yoke. Made of super soft and comfortable, Superior Quality 100% cotton material. This is an exceptional quality shirt, great for on and off the riding season. Our Black Label Collection is comprised of our signature Limited Edition Black Label line of Harley-Davidson gear for men. Won't be around for long, get yourself one before they are gone!